Oh I do believe there is no other more seductive word in the world than “control”. I love to be in control — of myself, the environment, of situations around me. I need control in order to function. Much of this has to do with my personality. Much has to do with being a sexual assault survivor. Regardless of where it comes from it is just as much a part of me as my hair is brown. And so when I lose control it can be overwhelming to me — even if it’s just with peaches. My first pregnancy was one lost control moment after another. Everything was felt in exuberance and with relish. I threw up with passion. I craved food like a drug addict needing a fix. My exhaustion was so complete I couldn’t remember driving home. My senses were an electrical parade and they were fritzing out. It shouldn’t have been too much of a surprise to me that my usual self-control would disintegrate as soon as I got a positive, yet it did. The realization finally struck me on the Day of the Peaches. What a terrible day. My nausea had been near debilitating. This was before the days of Zofran and we old-timers had to get by on soda crackers and gingerale. I was teaching full time with no preparation period and I would come home to sleep on the couch for hours, not wanting to eat just to see it be well-represented again later in the toilet. So when I came home from school on this one particular day and spelled fresh peaches I was surprised to actually feel my stomach growl. I thought I better eat one since a peach sounded good at the moment. These particular peaches were freshly picked from peach trees. At the time, my husband was coaching figure skating and these were given to us as part of a payment for his coaching fees. Normally I’d be a little irritated by that because you can’t pay bills with in-kind income, but I didn’t seem to mind that day. I stood at the counter, the size of a piece of art paper, and peeled a peach so I could eat it slowly. I was worried about keeping it down, thus ruining my love of peaches forever. I waited and realized that the first slice was going to stay down and ate the rest of the peach. What was the precise time of my undoing? The moment when I ate the last of my peach and thought how if one went down so well maybe a million more would, too. I reached into the bag and pulled out another peach. Ate that one. Then another. Then another. I have no idea what came over me. 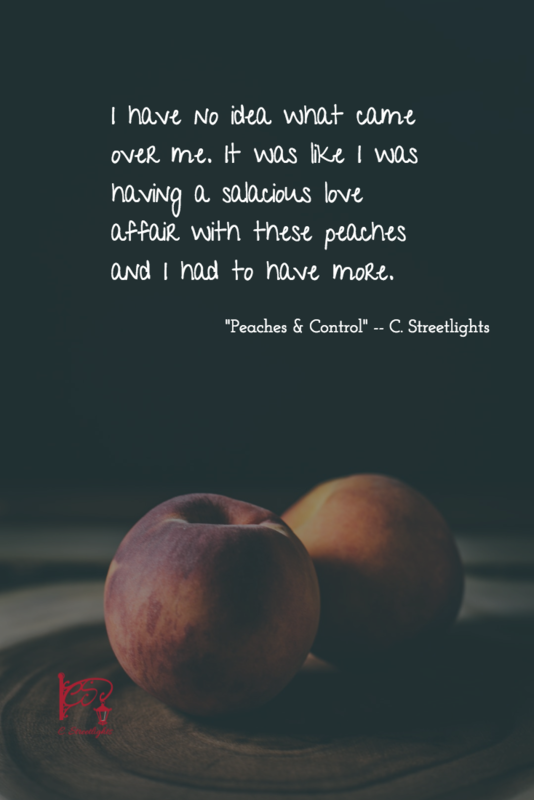 It was like I was having a salacious love affair with these peaches and I had to have more. I really have no idea how many peaches I ate that day. It was all a blurry haze by the time my husband came home. He found me laying on our couch, hands on my pregnant belly, looking completely ill. This time it wasn’t from the baby, it was from eating too many damn peaches. I felt so unbelievably nauseated that if I moved I thought I’d lose it. I didn’t move all night long, pathetic as I was, and he refused me any sympathy. I still love peaches. And control. Just a little at a time.